In the early 1800's Lewis and Clark went on a journey to explore the brand-spanking new territory that the United States purchased from France. And that was cool and all. But with all the note-taking and map making it was a little boring for the American people to read about once it hit the papers. Then the newspaper men came up with a great idea. It would change the entirety of American media. They were going to have another expedition but this time, instead of the trail-worn Lewis they were going to hire America's "it" girl, Louise Goodshot! Clark would lead the way and Louise would try and whip up some drama along the way. Now, they didn't get too far. Turns out reality shows had to be shelved until televisions became a thing. But still, Miss Louis's chic adventure fringe style lives on to this day! This belted tunic would be right up Miss Goodshot's alley. With a light buckskin color base, the dark brown fringe stands out on the shoulders and sleeves. The neckline is threaded with a faux leather thread. 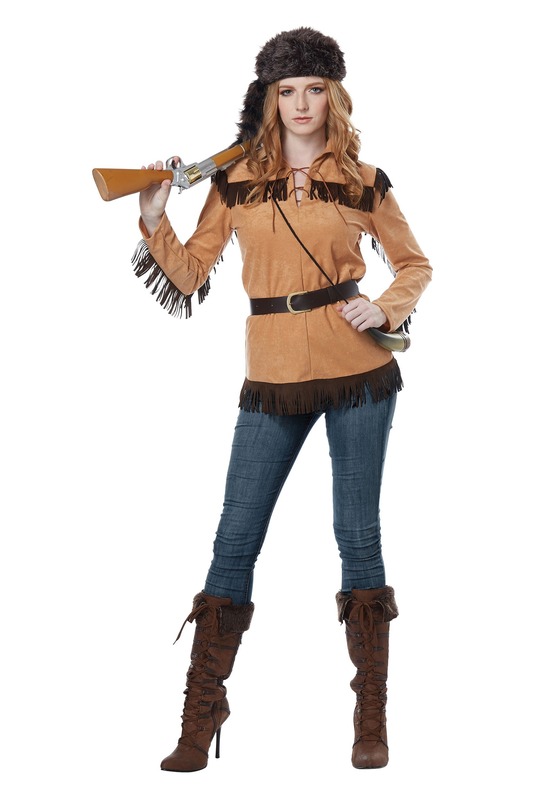 Pair this up with some leggings and explorer boots and you'll be ready for anything the wild west throws at you. If you're ready to hit the trail, make sure you're well equipped. A prop ax or rifle will take your character a long way! And you don't have to go it alone, that's pure danger. Instead, find a Clark who can draw up a map along the way. Now that we think about it when it comes to group costumes you've got plenty of options! Get together with Buffalo Bill and Annie Oakley. Whatever you do, you better be ready for the wild. Maybe it's time to practice your wolf call!